TS TET 2019 Schedule for Application Form | Telangana Teacher Eligibility Test Dates, Exam Pattern : TS TET 2019 notification released and apply before April 26, 2019 : Osmania University has announced the Telangana State Eligibility Test (TS TET 2019) date and other important details on official website @ tstet.cgg.gov.in. Candidates who are intended and eligible to get the teacher jobs in government schools can apply for this exam. The applications are required from eligible candidates. Below is the article given having all the important information about TS TET 2019 Eligibility Criteria, Important Dates, Exam Pattern, Syllabus, Admit Card and Result etc. 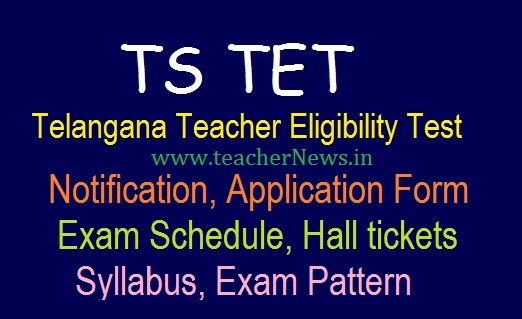 TS TET 2019 Notification Schedule, Telangana Teacher Eligibility Test Online Apply Dates, Eligibility Criteria, Hall tickets, TS TET Syllabus, Exam Pattern, Result @ tstet.cgg.gov.in. TS TET 2019 exam is conducted for determining the eligibility of Telangana job aspirants for the Eligibility for Teacher Posts in Telangana Schools. The TS TET examination will be conducted as per notification norms in CBT mode in centers spread over across the State. On the homepage see the notification regarding TS TET 2019 Notification. Click on that link, and read all the instructions carefully. Search for the link of Telangana TET Application form 2019, and click on it. Fill the Required Details in application form and click on Submit button. Pay the application fee via online or through offline mode. After successful completion of the form take the print out of the Application form and keep it safely. Telangana TET Online Application Form, Telangana TET Notification 2019, TSTET 2019 Exam Date, TS Teacher Eligibility Test Apply Online link at www.tstet.cgg.gov.in.